These comedy clubs keep the laughs coming until the final bow. With improv happy hours and full-set performances, Seattle’s comedy scene has something for everyone. Snap a photo at the famous Gum Wall before stepping inside Unexpected Productions (*1428 Post Alley; unexpectedproductions.org), where you can catch side-splitting shows at the competitive improv show Theatresports. Several blocks away in Pioneer Square, Comedy Underground (109 S Washington St; comedyunderground.com) has boasted such talent as Ellen DeGeneres, Jerry Seinfeld, and Rosie O’Donnell. Come to Monday open-mic nights to witness the next big names in comedy. If you’re looking for all laughs and no heckling, don’t miss The Comedy Nest, an inclusive improv show at The Rendezvous (*2322 Second Ave; therendezvous.rocks). Performed in the intimate downstairs theater, this empowering open-mic show encourages up-and-coming female-identifying comics to take the stage for a night of feminism and humor. 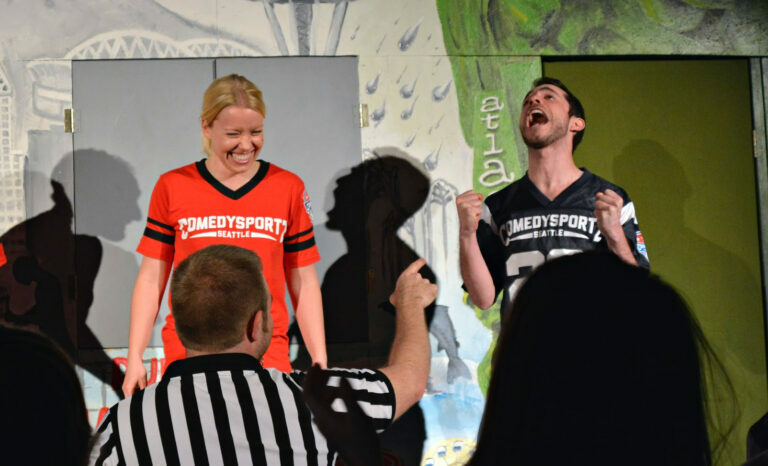 In Fremont, ComedySportz (3509 Fremont Ave N; seattlecomedygroup.com) puts on high-energy shows with plenty of audience participation and mini games. Take advantage of the all-ages shows and TeenTix (cheap day-of-event tickets available to teens) for guaranteed family fun. If you’re in the University District, you can’t miss the bright-yellow theater that’s home to Jet City Improv (5510 University Way NE; jetcityimprov.org), a comedy club with fan-favorite shows like Twisted Flicks, in which comedians create their own score and dialogue to B movies. And if you’re ready for more improv, see these local companies go head to head with international comedians in November’s Seattle International Comedy Competition (seattlecomedycompetition.org), the largest touring comedy festival in America.